Adding to the thousands of other commentaries about the 85th Annual Academy Awards, here are a few musings about what I felt was the easily the most entertaining Oscars telecast in years. 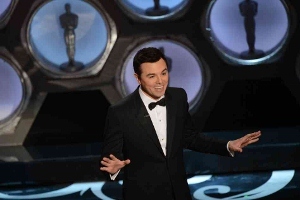 Not being especially well-versed in the world of Seth MacFarlane, I had no vested interest in how he would fare as host. I thought he ended up doing a great job, with the highlight being his interaction with William Shatner, who appeared as Captain Kirk during the show opening. Anyone expecting an overdose of snark or poor taste hopefully breathed easy. Despite a few relatively safe zingers, he seemed to play by the rules. Anyone expecting a Ricky Gervais-style roasting was likely disappointed. Though I personally don’t feel it was worthy of the coveted Best Picture, the Argo win allowed for the best acceptance speech of the night. 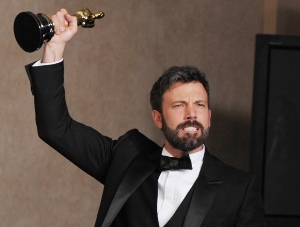 Ben Affleck seemed genuinely emotional and grateful to be up there, thanking those who stood by him before he was capable of helping anyone’s career in return. I’ve always liked Affleck (see him in the great, underrated Changing Lanes if you haven’t) and have been seriously baffled by the generally negative knee-jerk response so many people seem to have about him. It was also super gentlemanly of George Clooney to stay in the background, letting his co-producers Affleck and Grant Heslov bask in the spotlight. Speaking of the music, Shirley Bassey was not only the best part of the James Bond tribute, she WAS the Bond tribute. I couldn’t believe that after hyping the planned recognition of the 50th anniversary of Bond, that was all they came up with. Yeah, there was a montage of moments from all the films, introduced by Die Another Day Bond girl Halle Berry. But so what? I wanted to see the six Bond actors on stage together. I’m sure they probably tried (and obviously failed). Oh well, the opportunity will likely never arise again, given the age of some of those guys and how far in the future another commemorative date will even occur (“Bond 60” doesn’t have the same ring). Speaking of Bond, awesome to see Skyfall—for my money a film that was worthy of a Best Picture nomination (not even kidding)—pick up two awards, one for Adele’s song and the other for Sound Editing. How about that crazy tie with Zero Dark Thirty, too? I think the last tie was in 1969 when Barbra Streisand (on hand last night to sing at the close of the “In Memoriam” segment) and Katharine Hepburn shared honors for Best Actress. What a cool way to add some real drama to one of those awards most viewers aren’t usually terribly interested in. I have to say the most deceptively self-serving acceptance speech was Quentin Tarantino’s for Django Unchained. It was cool to see him win Best Original Screenplay, his first win since Pulp Fiction. But as he attempted to give the credit to his extraordinary cast (Christoph Waltz won the night’s first prize, for his supporting turn in Django), his praise seemed to keep coming right back to himself. “If people know my movies 30 or 50 years from now, it’s going to be because of the characters I created,” he said, emphasis on “I.” Then later, “I only get one chance to get it right… Boy, this time did I do it.” Maybe I’m reading too much into it, but it sounded kind of like unchecked ego to me. Still, his win was a cool upset to keep the night interesting. Then there was the biggest upset of the night, Ang Lee’s Best Director win for Life of Pi. After acknowledging the performance of Suraj Sharma, he said he couldn’t “waste this time” talking about the other cast members. I think it was just nerves that resulted in that seemingly disrespectful comment. He meant that he couldn’t waste time (they were, after all, playing the Jaws theme to get people off stage, but only the “minor” categories it seemed) trying to recall the cast members when he was obviously so overwhelmed by his surprise win. I will take that kind of spontaneity over Anne Hathaway’s boringly long list of names that she rattled off in her speech (for Best Supporting Actress, Les Miserables) any day. Oh, and First Lady Michelle Obama helping Jack Nicholson present Best Picture? Interesting idea, but I prefer to see the awards presented in the actual auditorium, not via satellite. Why couldn’t she have just flown out for the broadcast? Oh well, if the orchestra was able to play from down the street at the Capital Records building, might as well start outsourcing the whole thing, segment-by-segment. In one of the more amusing live tweets I saw, Steve Martin said that Adele’s orchestra was actually on the moon. For a complete list of the night’s winners, click here. i totally agree that skyfall was worthy of a best picture nomination. the whole reason the new format was created was to allow “larger” films to have a chance to be nominated/win and i think skyfall was a much better film overall than, say, les miserables. it was nice to see it get some recognition, i just wish it had been nominated for more.